Interestingly, ammonites are thought to have become extinct at the same time as the dinosaurs. 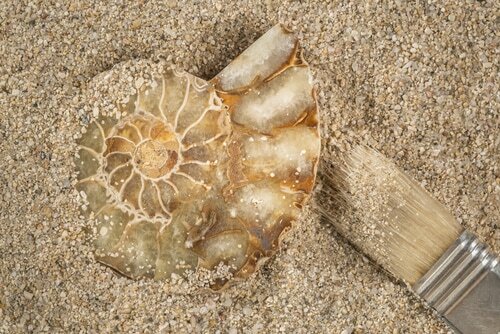 Having lived during the Jurassic and Cretaceous Period, these interesting marine animals often had a spiral shell that is similar to the modern day nautilus. Although they are similar in appearance to the nautilus, their closest living relatives are the octopus and squid. When you see this fossil, you are seeing the exoskeleton, which would have been buried in sediment and then over time, solidified into rock. The soft tissue on the inside is not usually preserved. 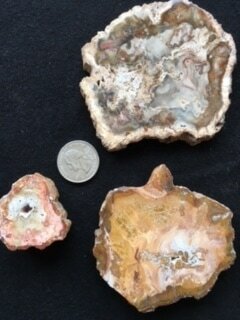 We sell sliced ammonite pairs in a small size (about the size of a quarter) and in sizes of up to 20 cm! 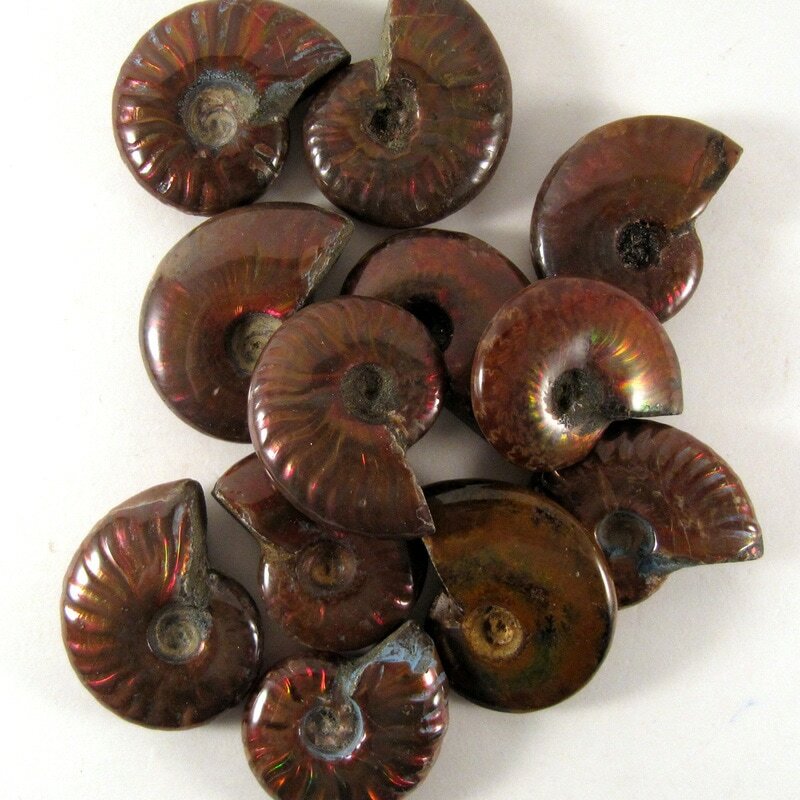 Red Flash Opalized ammonites lived during the Early Crustaceous period (100-113 million years ago) and ours come from the island of Madagascar, which sits off of the SE coastline of Africa, in the Indian Ocean. The red and green iridescences in their shells is from the mineral, aragonite. Some ammonites grew as large as three feet across their shell, and they had strong, sharp jaws inside of tentacles. The piece of art in the photo below is made from a real ammonite shell and copper/brass. The tentacles covered their sharp jaws. Learn more about ammonites here. disappeared at the same time as the dinosaurs. ​It is thought that our white ammonites are Perisphinctes ammonites; which livroced during the Jurassic Period, approximately 160 million years ago. Scientists determine their age by studying the size, shape, and patterns in their shells. Ammonites are considered a "guide" fossil in stratigraphy. 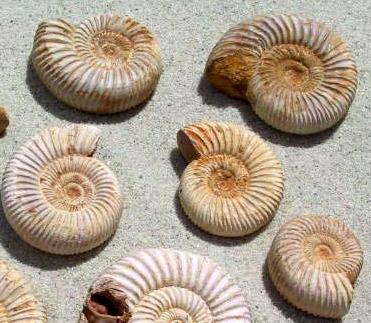 This means that scientists use ammonites to research and figure out the age of rocks in the layers of rock formations. Ammonites swam in schools, were carnivores, and the female often grew up to 400 % larger than the males. ​Their hard shell was their shield of armor from predators. This video demonstrates how to draw the Golden Ratio/Spiral using the Fibonacci Sequence and a compass. 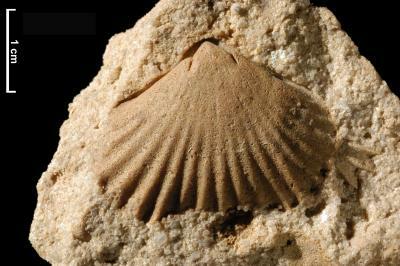 Earth Treasures' brachiopods come to us from Morocco. These invertebrates lived in the ocean during the Cretaceous Period, approximately 100 million years ago. Brachiopods have been found that are at least 550 million years old! Their only defense was their two shells. They often attached to hard surfaces like the rocky outcroppings and rocks on the surface of the ocean floor. For more information on brachiopods, check out OneGeology.org ! An arthropod, like insects, they had three body sections, the head, thorax and tail. 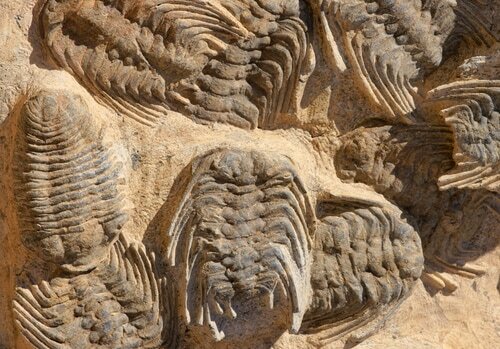 Trilobites were one of the first animals thought to have vision. They roamed the oceans for over 270 years because they adapted well to their environment. They were scavengers, predators, and prey in the food web. 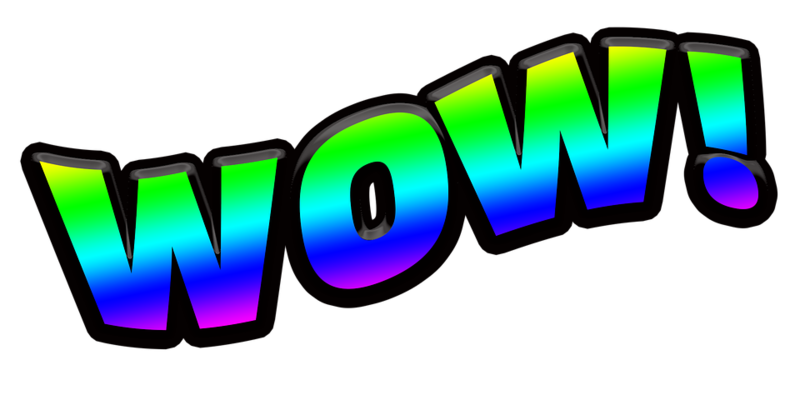 Extinction occurred about 250 million years ago. 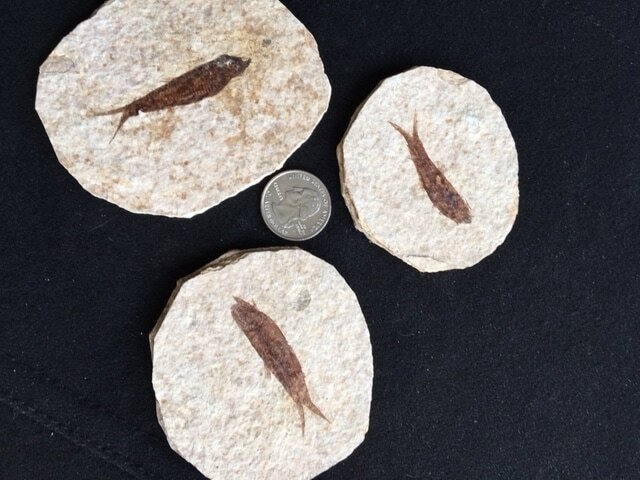 Our wonderful specimens of fossil fish can be found in our own wonderful state! 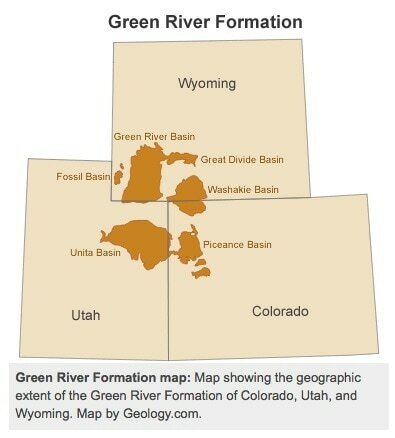 One of the most abundant sources of fossil fish in the world, the Green River Formation is an area covering southwest Wyoming, Utah and Colorado. Our fossil fish come from this area. • The fossil fish that we provide to schools lived approximately 50 million years ago. • To watch a 30 minute video on how this area was formed, click here. 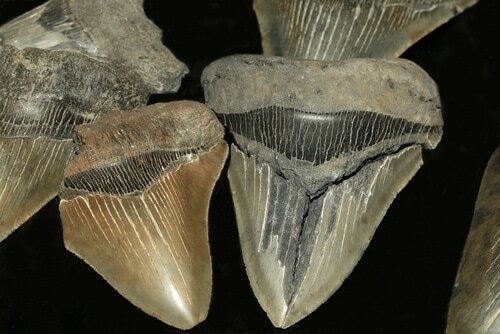 Our fossil fish teeth are from the species, Enchodus. Although they closely resemble today's salmon, they are often called the "sabre-toothed herring." We sell the "fang" tooth of these predators. Click on this image from www.prehistoric-wildlife.com for more wonderful information and graphics on these prehistoric fish. 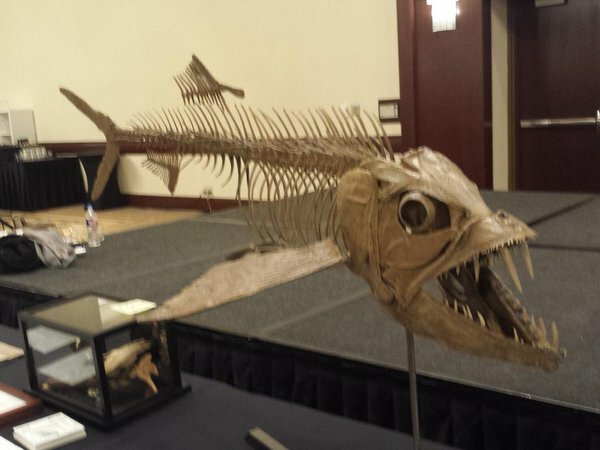 This "saber-toothed" fish lived during the Cretaceous-Early Eocene period, 90-50 million years ago. 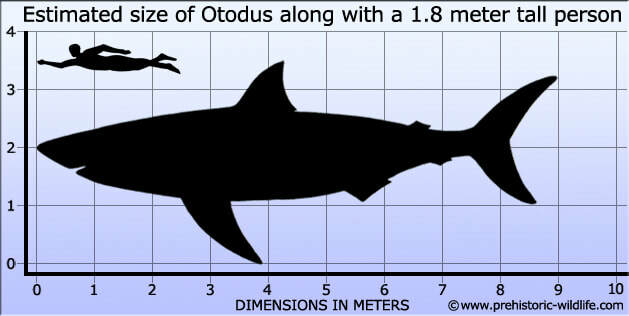 ​The image below is a cast of the Enchodus. 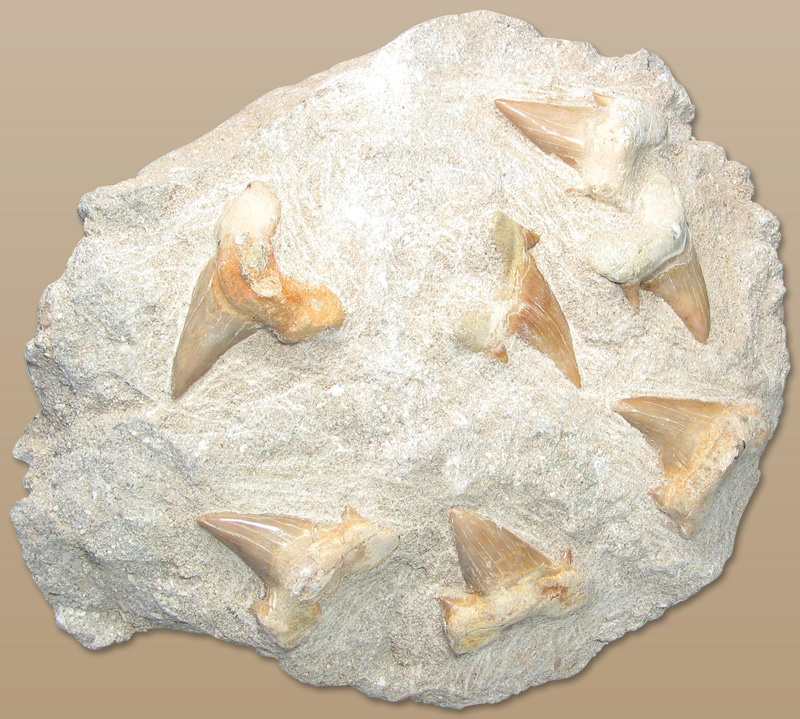 PLEASE NOTE: Our megalodon shark teeth are partial teeth, as that makes them affordable for students. European people in the middle ages believed that these teeth were petrified dragon and snake tongues. Pliny the Elder, a Roman author and naturalist who lived around 70 A.D., thought that the teeth were dropped from the sky during an lunar eclipse. Grew up to 60 feet in length and weighed up to 65 tons. That's 130,000 pounds! Lived during the Middle-Miocene to Pliocene Periods; 16 to 2.5 million years ago. Have been found on every continent except Antartica. Our specimens are considered "partial teeth" which makes them affordable to kids. 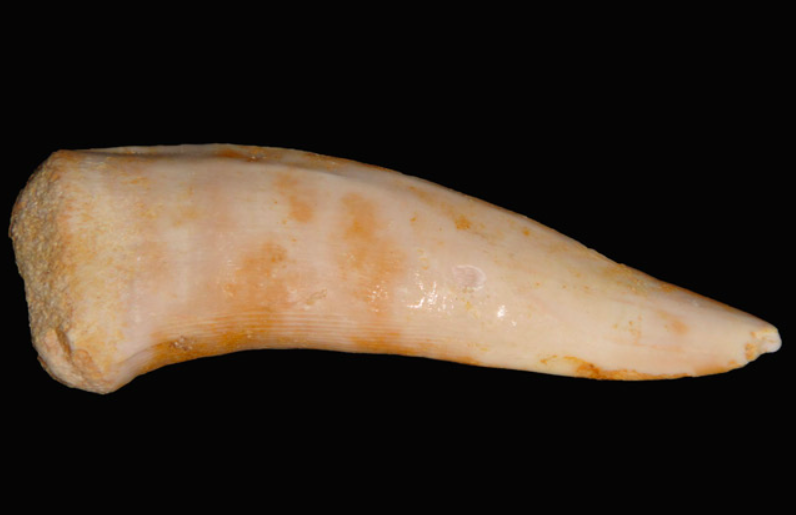 Otodus shark teeth in matrix. This means that they are in the natural state of the rock that they were found in. Paleontologists have used their tools to clean around the shark teeth. We sell single shark teeth in matrix like this as well as single teeth. When we talk about the top of the food chain, we are talking about Otodus Sharks! They were an apex predator, meaning they had no natural predators. (Other apex predators are killer whales, polar bears, tigers, lions, and saltwater crocodiles, to name a few.) One of the largest sharks of the sea, the otodus shark grew up to 9 meters in length, five times the length of a six foot tall man. Scientists believe this shark was a direct ancestor to the megalodon. It lived during the Cenozoic Era (60-45 million years ago). These critters are SO COOL! They have five part symmetry within the star shaped center. These five pores were actually paired rows where the feet projected from the urchin. When alive they were covered in spines. What you see is their exoskeleton. Their genus name is actually Latin for "Bearer of the sun" because of the finger like projections, which resemble rays of the sun. 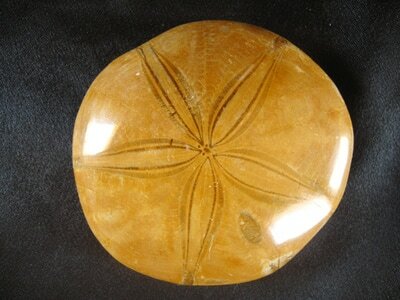 This blog, The Echinoblog, is an excellent source of information about these strange looking sand dollars. Legend has it that these strange little fossils are coins left by mermaids! 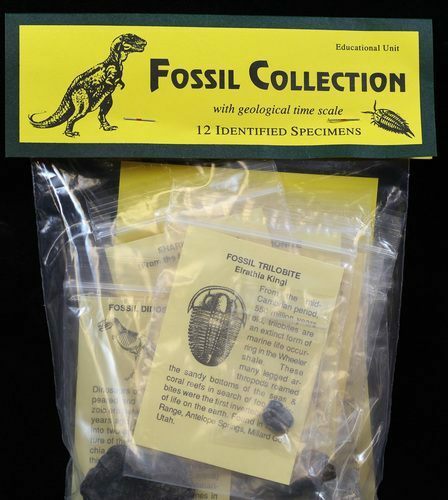 Our fossil collection is perfect for the budding fossil collector as it contains 12 different fossils with identification cards containing basic information for beginner collectors on each card. and various other small fossils!! One of my favorite fossils! They are so beautiful when the star is prominent! The fossil is the skeleton of the animal; which was an echinoderm. These marine animals are commonly called sea urchins. These irregular sea urchins did not have long pointy spines, but short spines that helped them move in the muddy and sandy sea bottoms. Our sand dollars have been polished. I learned all this from Dr. Chris Mah's EchinoBlog. You may enjoy watching this video of fossil hunters in Florida searching for sand dollars. I love these guys as they pick up the trash as well as finding awesome fossils! 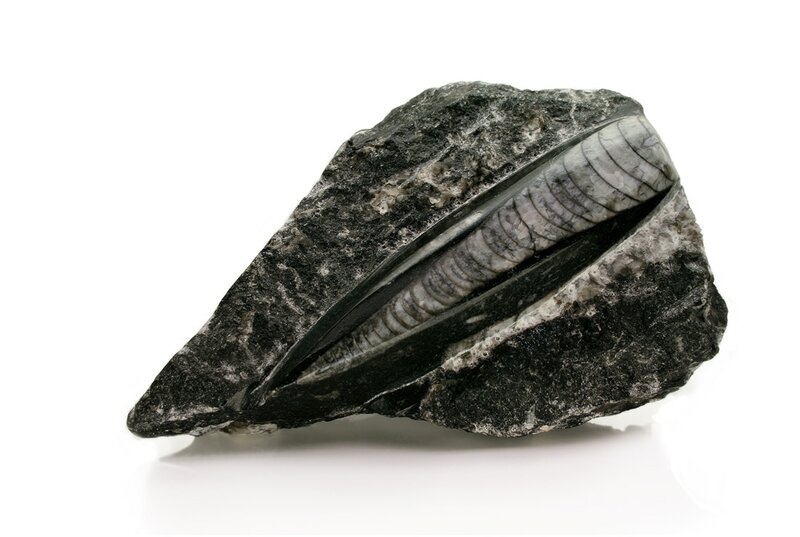 The 400 million year old relative of today's squid, the orthoceras grew in segments or chambers. When its house got to be too small, a dividing wall grew between the old home and the new larger home (chamber); the marine animal moved in. 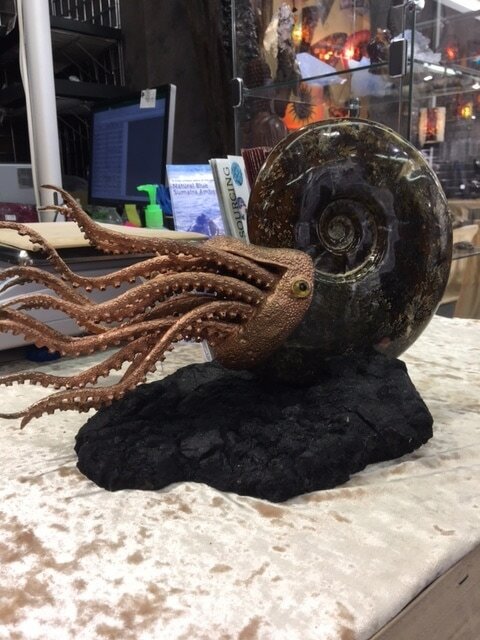 At Earth Treasures, we sell small2-3" long orthoceras, larger 4-7" specimens, and even larger artistic towers, stand ups and plates. They are our earth's natural artworks! Petrified wood is one fantastic fossil! It happens to be a favorite of ours here at Earth Treasures. We carry pocket sized petrified wood from Oregon and Arizona, and larger sizes from Madagascar. 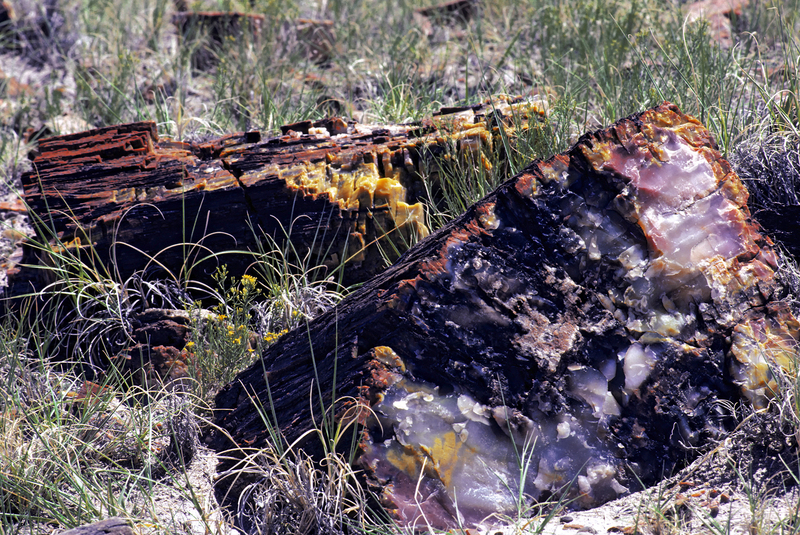 ​ Petrification of wood occurs over millions of years and can be found all over the world. Normally trees decay from being exposed to oxygen and organisms that break down the wood. However, when a tree is buried by sedimentation or volcanic ash, it is not exposed to oxygen or small organisms who help the decay. Thus it decays quite slowly, over millions of years. And over time, ground water flows through the tree leaving behind minerals which take the place of the the inside of the tree. The tree keeps its structure and the minerals turn to stone! Check out this 2 Minute video on petrification! It is A.MA.ZING! You should also see and read this from The Kid Should See This website. It is a National Geographic Kids video and is perfect to see how petrified wood is formed.